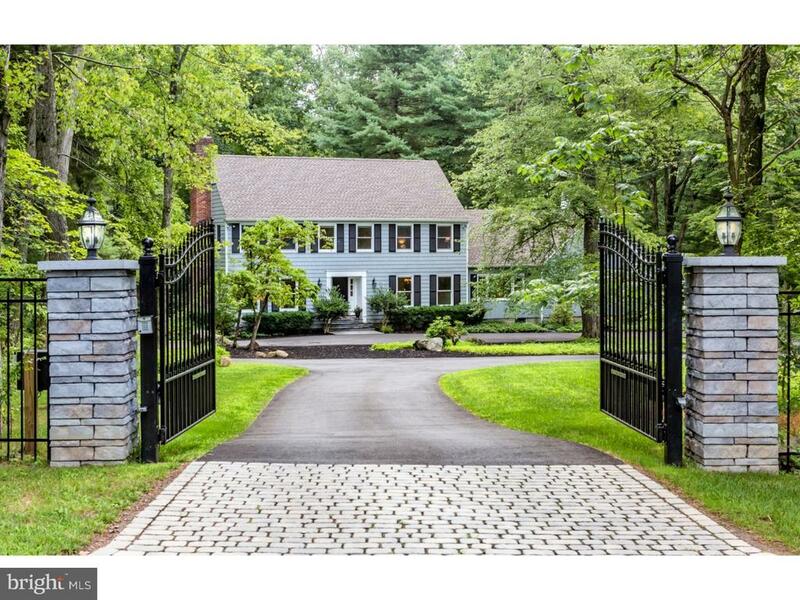 Though only minutes from downtown Princeton, a peaceful, countryside-retreat feel surrounds this gated cul-de-sac Colonial, courtesy of wraparound tree views, a scenic backyard stream, and magnolia-shaded patios. Set amid some of Pretty Brooks finest homes, this elegant residence captivates with 3 wood-burning fireplaces, hardwoods, and an endless list of recent updates that include all mechanical systems. Entertaining-perfect interiors with leafy views include a wainscoted dining room, front-to-back living room, and a spectacular Great Room, where a fieldstone fireplace rises to cathedral heights. A modern country kitchen shines with premium stainless appliances and cream cabinetry with pull-outs (including a hidden spot for a microwave.) Step out to a tiered deck - a front-row seat to the paddle tennis court! A guest-friendly 1st floor bedroom enjoys a nearby full bath; 2 stone-trimmed baths serve 4 upstairs bedrooms with walk-in closets, including a fireside master suite. The walkout basement, framed with electric, is ready for finishing. Inclusions: All Appliances, Window Treatments And Light Fixtures.